R.G. Springsteen’s Conquest of Cheyenne was the last Red Ryder adventure to star “Wild” Bill Elliott. Bobby Blake, who plays “Little Beaver,” the adorable little Indian boy whose biggest challenge in life is the English language, would stay with the series for seven more films, but after Conquest of Cheyenne, Allan “Rocky” Lane took over as the stalwart comic-strip cowboy Red Ryder. As last hurrahs go, it’s not much, which is too bad. I really like Elliott’s stolid presence in these western programmers, and looked forward to each new one that came out. Unfortunately, Red Ryder, Little Beaver, and Ryder’s aunt, “The Duchess” (Alice Fleming), are barely characters in this film. For the most part, it focuses on an ambitious young man named Tom Dean (Jay Kirby) and his dream of bringing a big oil-drilling operation to west Texas. Speaking of locations, the Duchess’s ranch sure did move around a lot. Just look at the list of Red Ryder films with a place name in them: Tucson Raiders (1944), Marshal of Reno (1944), The San Antonio Kid (1944), Cheyenne Wildcat (1944), Vigilantes of Dodge City (1944), Sheriff of Las Vegas (1944), Lone Texas Ranger (1945), Marshal of Laredo (1945), Colorado Pioneers (1945), California Gold Rush (1946), Sheriff of Redwood Valley (1946), and Sun Valley Cyclone (1946). In a lot of cases, of course, the names of the films had nothing to do with where the action actually took place, and that’s the case here. 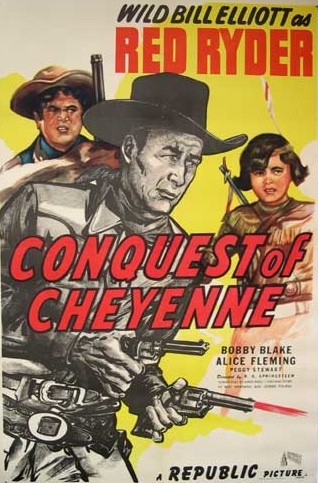 Conquest of Cheyenne takes place in Texas, and Cheyenne refers not to the city in Wyoming, but to a young woman, Cheyenne Jackson (Peggy Stewart). Is there a conquest of her in this movie? ‘Fraid not. Cheyenne (the Duchess’s second cousin on her mother’s side) goes missing, and is believed kidnapped by the bandits, but she soon arrives in Muleshoe driving an out-of-control automobile. It turns out she wasn’t kidnapped after all, and the whole bandit subplot is largely forgotten. Soon, the comic relief character “Daffy” (Emmett Lynn) will be forgotten, too, but at least we are treated to a good old fashioned dousing in a water trough when he falls in while attempting to get out of the way of Cheyenne’s car. And of course he emerges spitting a stream of water out of his mouth like a fountain. Tom believes oil is the future of west Texas. There are already oil wells in east Texas, and he believes the entire state is heading in this direction, but he’ll not only have to convince the townspeople of Muleshoe, he’ll have to contend with an evil banker named Tuttle (Milton Kibbee), who plans to foreclose on Cheyenne’s ranch and take all the oil for himself. He’s aided in his crooked scheme by dependable Republic heavy Kenne Duncan as a geologist named McBride. As I said, Red Ryder and Little Beaver don’t have much to do in this picture. It’s mostly Tom and Cheyenne’s story. Elliott does get the last words of the picture, however, when he rides in and sees Tom and Cheyenne lying on the ground, both being sprayed with oil gushing from Tom’s well on Cheyenne’s property. “Looks like the preacher’s gonna have to take care of both of ’em!” Red says happily. OK, maybe that counts as a conquest. For Tom, at least. Posted in 1946, July 1946 and tagged Alice Fleming, Bert Horswell, Bill Elliott, Bobby Blake, Charles Craft, Conquest of Cheyenne, Earle Snell, Emmett Lynn, Frank McCarroll, Fred Harman, George Sherwood, Jack Kirk, Jay Kirby, Joseph F. Poland, Kenne Duncan, Little Beaver, Milton Kibbee, Peggy Stewart, R.G. Springsteen, Red Ryder, Republic Pictures, Richard Cherwin, Robert Blake, Sidney Picker, Thunder, Tom Chatterton, Tom London, Westerns, Wild Bill Elliott, William Bradford. Bookmark the permalink.